← Spring Ahead – Fall Back! Home » Uncategorized » If You Want a Friend in Washington DC…Get A Dog!! 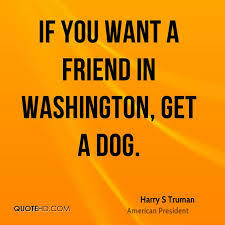 If You Want a Friend in Washington DC…Get A Dog!! Harry Truman wasn’t just a President, he was a prophet! As of this week, President Barack Obama has good reason to take Truman’s words seriously and remember them well! Also, the Democratic party which ran away from him like a bunch of scared rabbits could use a heapin’ helpin’ of Truman’s courage to live by, because no President ever got abandoned by his party to a greater degree than President Obama did during this massacre! I’ll bet he knows how Custer felt and the term “divide and conquer” was never truer, more evident, or more sad to watch if you believe in an equal shake for all! Defense of women’s reproductive health issues was abandoned, the Republicans split the Democratic candidates away from their president along with everything they fought to achieve, then, they picked them off like ducks in a shooting gallery! I’m not going to say it was wrong, I think there’s a perverse justice in there somewhere, and a huge lesson to be learned! In a way, the voters who could vote or spend a little money and didn’t, got what they deserve, NOTHING! The folks working for minimum wages got what the Republicans wanted to give them. Will the Koch brothers see a big financial return on their mammoth investment? We’ll just have to wait and see! Maybe it’s time to write about something more on the positive side of the ledger. As most of you who have read previous entries of this blog already know, I have a friend named Carol “CJ” Johnson. She is the lady who runs the “Senior Assistance Center” at 44th Ave and Federal Blvd. here in the city. Senior Assistance Center is a “food bank” where low income folks can come by and pick up food essentials to help put meals on the table when they have too much month left at the end of the money! On top of this, she is doing a phenomenal job in the neighborhoods delivering food in trucks to families in large, low income developments who may have no transportation and are basically landlocked because of their handicap. CJ sees a growing need here, and is building the food delivery side of her enterprise as much as limited finances will allow. If you’re in the neighborhood, drop by and donate a few bucks! I’m sure it will be appreciated, and she’ll find a home for it in a hurry! Here’s a part of the story that will warm your heart! Recently, CJ told me about a special little seven year old boy named Henry. It seems that Henry is learning to play the accordion and recently he was asked to play for a dinner at his church. 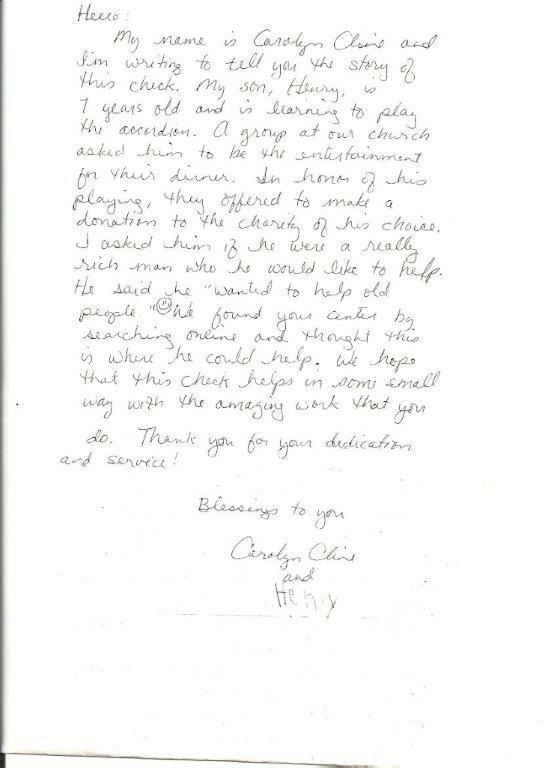 In payment for his service, the folks at the church asked Henry where he would like them to make a donation in payment for his work. My name is Carolyn Cline and I’m writing to tell you the story of this check. My son, Henry, is 7 years old and is learning to play the accordion. A group at our church asked him to be the entertainment for their dinner. In honor of his playing, they offered to make a donation to the charity of his choice. I asked him if he were a really rich man who he would like to help. He said he “wanted to help old people” 🙂 We found your center by searching online and thought this is where he could help. 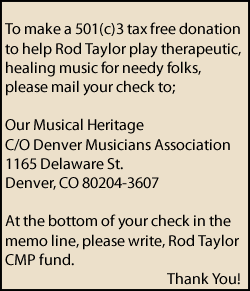 We hope this check helps in some small way with the amazing work that you do. Thank you so much for your dedication and service! WOW! If only we could ship Henry’s wonderful attitude to Washington DC! Think of the changes we could make, and the uplifting that could be done…it is sorely needed! This entry was posted in Uncategorized and tagged Harry Truman, President Barack Obama. Bookmark the permalink. We did ship Henry’s attitude to Washington D.C. and they have been trying to impeach him for the last six years.